108 N. Old Standing Springs Rd. Approximately 6 Units will be sold individually, regardless of price, for cash to satisfy liens. Household contents, furniture, tools, etc. 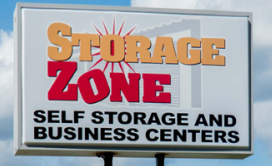 Storage Zone Self Storage personnel will be opening the units and you will be allowed a quick through-the-door inspection but you will not be allowed inside the units prior to the bidding. When the Buyer has been awarded the unit he/she must pay cash upon conclusion of the auction for the unit in the amount of the bid plus a 10% Buyer’s Premium and unless a valid reseller certificate is provided then a 6% sales tax must also be paid on the total sale price. Storage Zone Self Storage shall furnish the Buyer with a cash receipt upon payment of the unit contents. The Buyer must provide a $100/Unit security deposit and must remove all goods within a twenty-four (24) hour period or the goods will become the property of Storage Zone Self Storage, unless, the Buyer signs a lease agreement for said unit, and pays the current month’s rent in full. Failure to remove all goods or sign a lease will result in the Buyer forfeiting the security deposit. Buyer is responsible for securing the unit holding the property purchased for the 24-hour period. This is to inform the buyers prior to the sale that all bidders must register with Storage Zone Self Storage and by doing so acknowledge these rules of the auction. Buyer acknowledges that he or she is bidding on all items within the unit and all items must be removed and the unit must be cleaned. The Buyer must provide a $100 security deposit and must remove all goods within a twenty-four (24) hour period or the goods will become the property of Storage Zone Self Storage, unless, the Buyer signs a lease agreement for said unit, and pays the current month’s rent in full. Failure to remove all goods or sign a lease will result in the Buyer forfeiting the security deposit. Buyer is responsible for securing the unit holding the property purchased for the 24-hour period. Bidders acknowledge that bid rigging and / or collusion is a felony and a violation of the Sherman Antitrust Act. All suspected instances will be reported to the U.S. Justice Department. All bidders agree to hold harmless and indemnify Storage Zone Self Storage, the Auctioneer, and Palmetto Auction & Realty, LLC of any and all claims. Bidders must be at least 18 years old.